My son had a friend over for a sleepover last night. I knew breakfast for a kid outside our family couldn’t consist of sautéed veggies. The problem was that we just got back from Christmas in Michigan yesterday and my fridge and pantry contained zero eggs, no syrup, no bread, and just about 1c of milk. That ruled out cereal, pancakes, french toast and anything else breakfastish I could imagine. But then I remembered that when my baby was egg free, I always used 1T. chia seeds and 3T. water mixed up and set out for about 5 minutes to replace an egg in baking. Bingo! I could make grandma’s pancake recipe with the scant 1 cup of milk in my fridge. 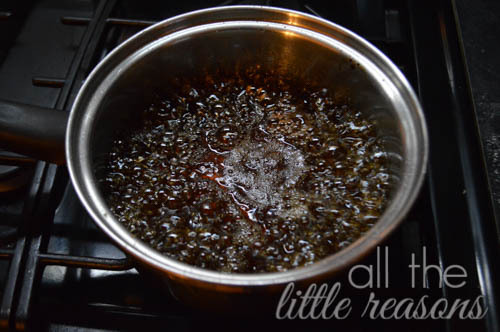 Plus, my mom always made our syrup from scratch with sugar, water and maple flavoring. 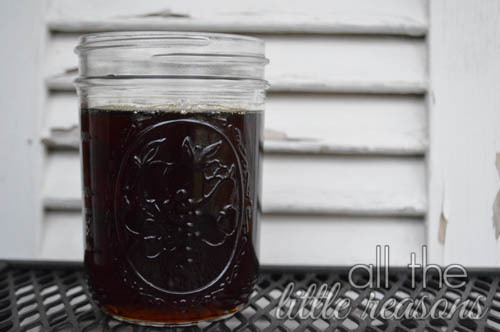 I usually use real maple syrup, but my gallon ran out and I’ve yet to write a letter to the sweet Amish family in Michigan where I’ve purchased in the past. And I was pretty sure I had a random bottle of maple flavoring I bought just in case I was ever desperate enough to try to make my own. So here it is — and can I tell you that it was a huge hit? The kids seriously gobbled it up and all was well! 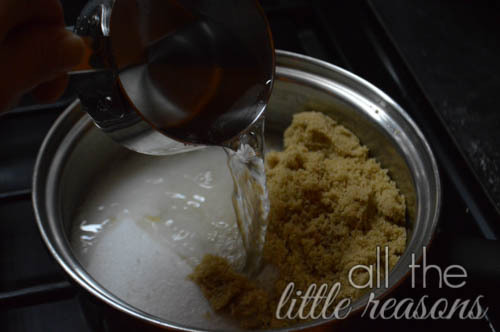 Mix the brown sugar, white sugar and water. 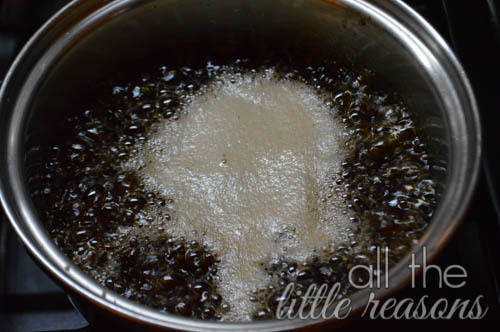 Boil 3 minutes (this is what mine looked like toward the end of the three minutes). Remove from heat and add the maple flavoring. Done! Can you even believe how easy that was? My daughter whipped up the pancakes while I was making this and breakfast was on the table in about 15 minutes flat. From scratch. Bisquick and Log Cabin don’t stand a chance when you can make your own so quickly and actually know what’s in your food! Mix both sugars and water. Bring to boil. Boil for 3 minutes.